I may not have census records for Nocciano like I do for Civitaquana, but Nocciano is smaller, so it is a bit easier to trace people back to the original families of a particular surname. Today – DI MECO. Two of my great-great-grandmothers were di Meco’s. In fact, they were sisters! So my grandparents were actually second cousins. Also, based on that marriage record with Giustino di Meco and Rosario di Meco, there should probably be another son Giustino born before 1748 as well. 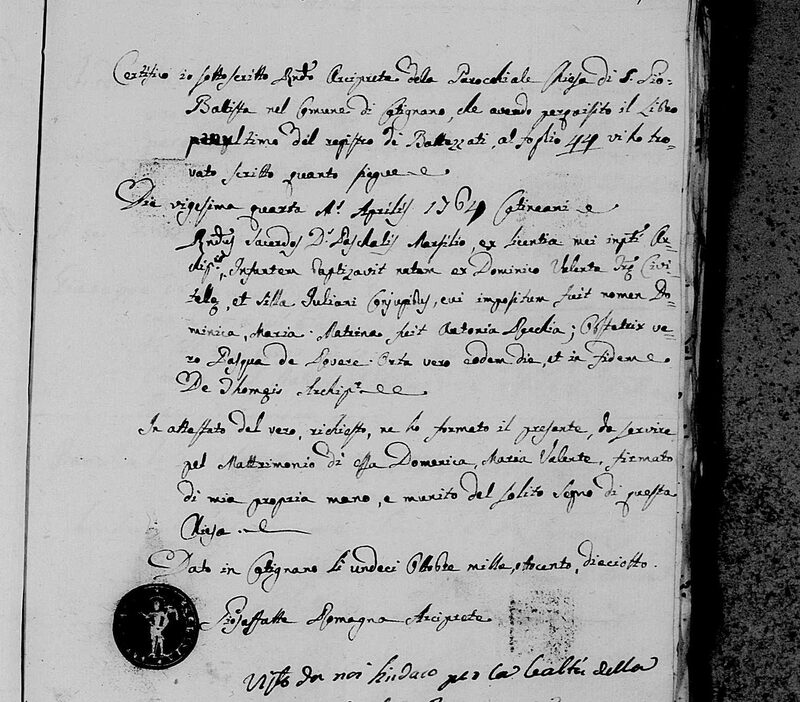 Right now, everything points to my 5th-great-grandfather Rosario di Meco being another older son of Giosuè di Meco: (1) his birth year falls right between Biagio (1741) and the earliest baptism record I have, which is for Chiara di Meco (1749); (2) the parents listed on his death record match up a little too closely to the names Giosue (Giuseppe) and Diadama (Agata), and (3) there is no other person whose record has the names Giuseppe and Agata. While this unfortunately isn’t enough proof to confirm this, it is pretty damning! And it would mean that all DI MECOs in Nocciano go back to the one couple Giosuè and Diadama – I love when I’m able to do that. 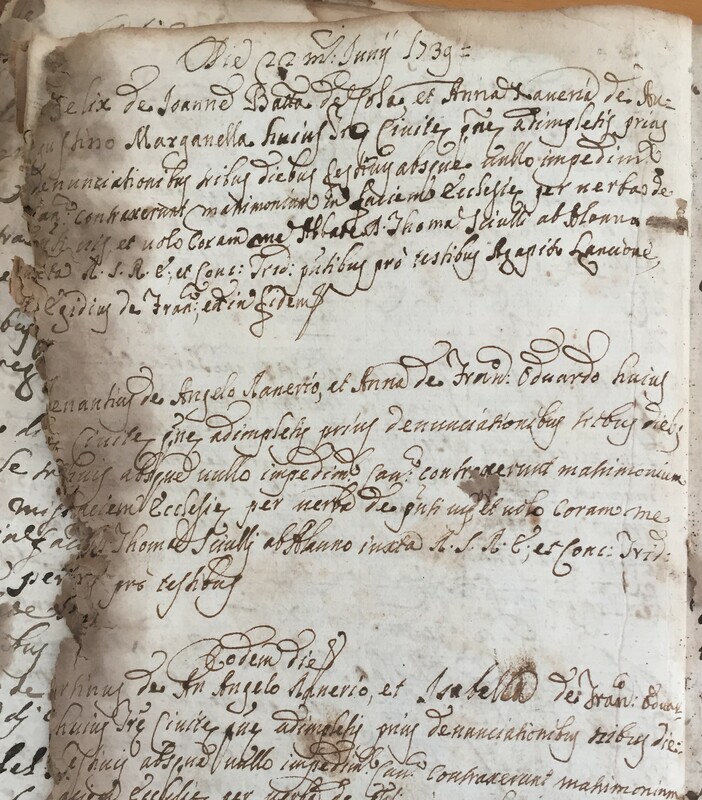 Several months ago, I noticed on the FamilySearch website that they are in the process of publishing the CATASTI ONCIARIO for the Kingdom of Naples – a civil census done for all comuni that were part of the Kingdom of Naples around the year 1750. When this comes out, this will be SUPER HELPFUL for the towns of Pescara (all of which I believe were part of the Regno di Napoli). For this family in particular, we’ll be able to see any of the children born before 1750 (and still alive), living with their parents. If Rosario is part of that family, that’ll be all the proof I need to make this connection. Death record for Rosario di Meco (abt. 1742-1817). Stay tuned for more posts on the families of Nocciano and Civitaquana! I’m not totally sure about the wife of Francesco Brandolini. 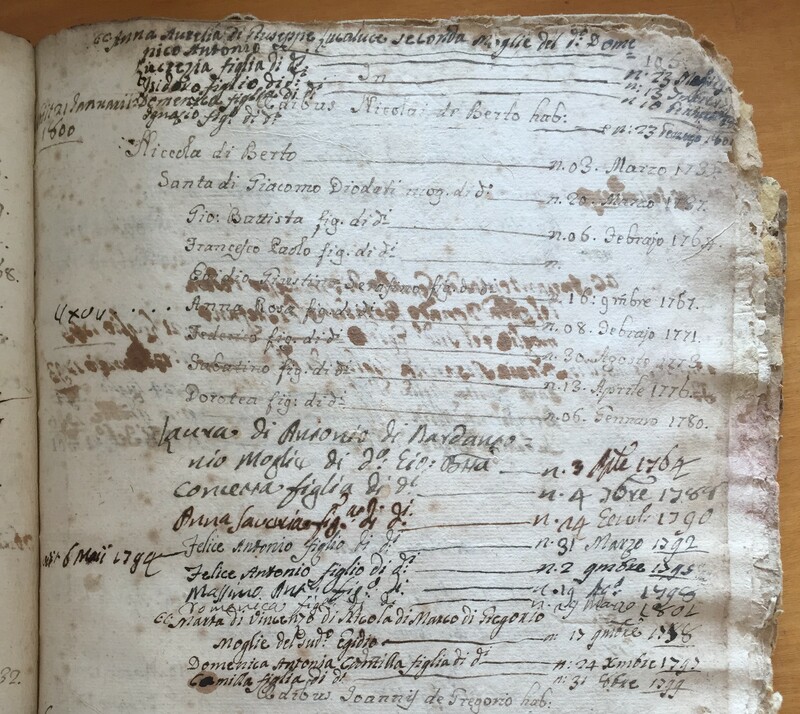 The civil death record for her son Luigi says “figlio di Francesco Brandolini e Santa Faricelli”, meanwhile the only marriage for a Francesco Brandolini I can find is the one above. There is also only a death record for Maddalena Brandolini on 17 Jul 1760. It says “moglie di Francesco Brandolini d’anni 46”. 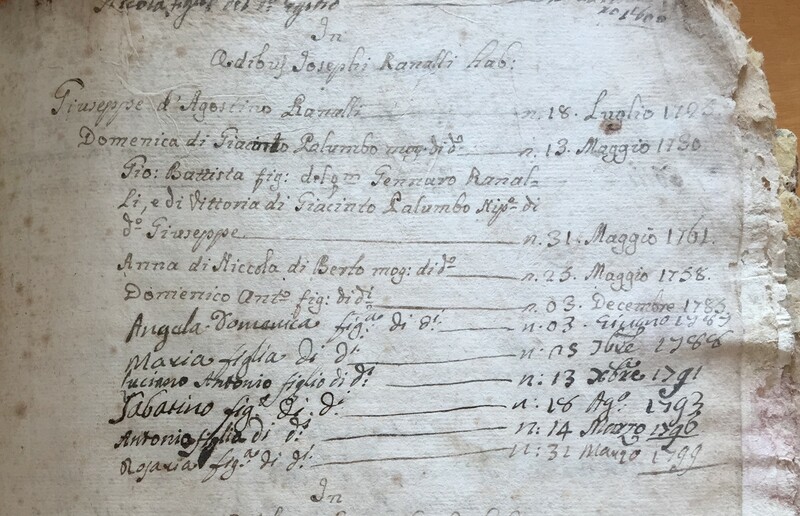 In the absence of any other marriage record or death record for a Santa Faricelli, I’m inclined to say they are the same person – Maddalena Santa Faricelli (1714-1760). There is another family – Mattia Brandolini – that is supposedly from Catignano, so I haven’t included them here. Also, I’ve seen elsewhere that the Brandolini’s originate from Civitella Casanova. I have in my tree a Dea Brandolini on my Pianella side, originally from Penne. So it’s not clear exactly which town they came from, or if they’re even all related. But at least in Civitaquana, most of them connect back to Francesco and Benedetto (meaning I’m related to all of those!). Angelo Ranieri (abt. 1665-) & Saveria Cetrano, my 7th-great-grandparents! Now there are still two RANIERI families I haven’t yet been able to connect to Angelo Ranieri, for lack of any parental information: Bartolomeo Ranieri and Giuseppe Ranieri. Bartolomeo (1720-1770) is actually also a direct ancestor of mine through his daughter, Caterina Ranieri, married to Rosato Palumbo (and Rosato Palumbo’s mother is a NAPOLEONE!). Giuseppe Ranieri (1726-1790) married Antonia Cetrano, and no church records give the name of the father for Giuseppe or Bartolomeo. Given that they were born before any of the previous Ranieri’s got married (1739/1740), they are most likely younger children of Angelo and Saveria Cetrano. The marriage of Angelo Ranieri and Saveria Cetrano. 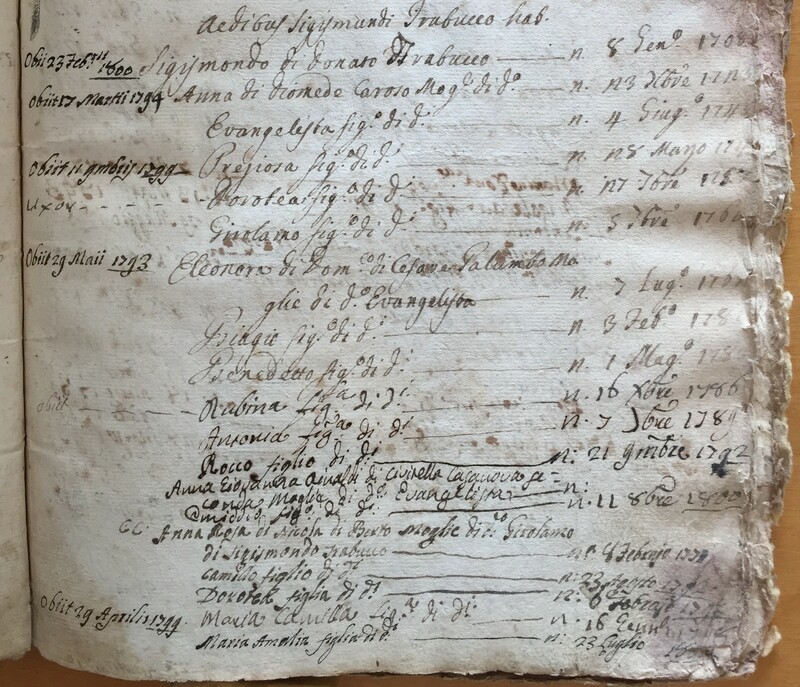 It is the first record in the marriage book for 1691-1774 marriages in Civitaquana, and the date is so faint that it’s tough to determine the actual date. 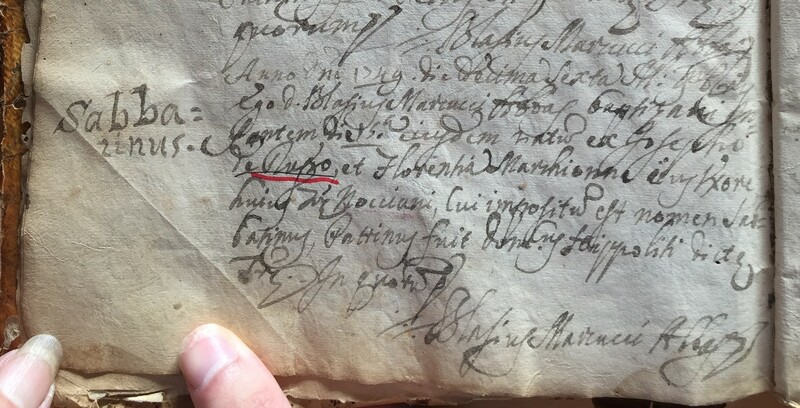 My guess is 13 Oct 1691 (it looks like it says 8bris, which is the Latin abbreviation for October). 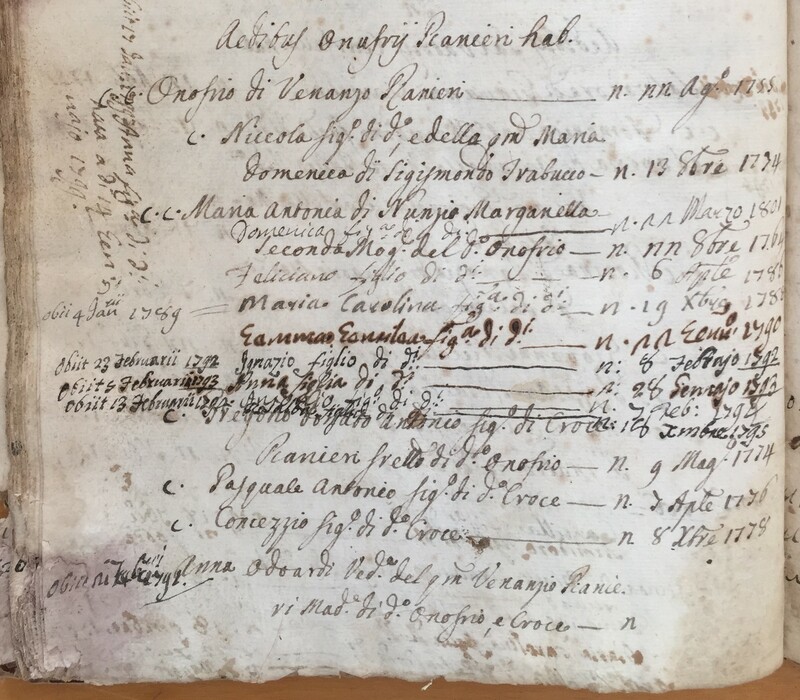 This is the baptism record attached to the marriage of Domenico Antonio de Laurentiis and Anna Maria Valente (although here her name is Domenica Maria Valente). This was her second marriage after her first husband, Lorenzo della Rosa, died in 1817. I don’t think it’s a coincidence that there is a couple Pasquale Valente and Francesca Giuliani from Catignano who would have been born around 1720-1730 (since Annafelice was born abt. 1753). 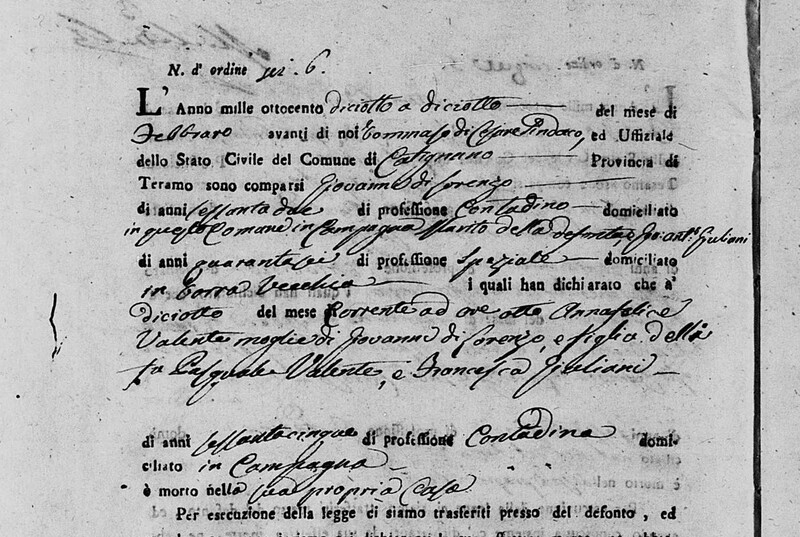 This marriage record says that Anna Antonia “oriunda a Catineano”, confirming that she was born and grew up in Catignano. Other records have her name listed as Caterina. 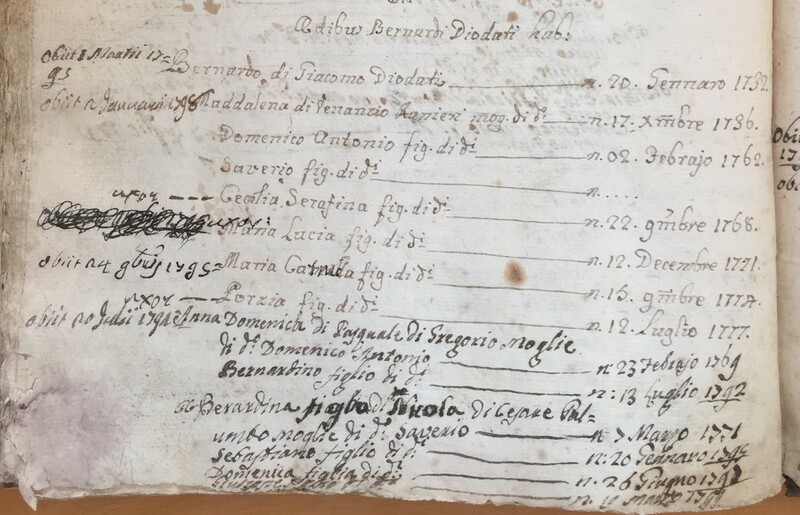 So my hypothesis is that Domenico and Pasquale Valente, both of Civitella, married Silvia and Francesca Giuliani, both of Catignano around 1750. They all had children in Catignano, and then Domenico and Silvia moved to Nocciano when their children married some Noccianesi. All the Valente’s in Nocciano go back to Domenico and Silvia Giuliani, and the presence of Valente’s and Giuliani’s (but not a lot) in Catignano point to origins in one family. We can put this question on hold until we get a further look at the Catignano church and civil records and then start looking at Civitella Casanova. So all di Berto’s in Civitaquana will lead you back to one of Nicola’s sons: Giovanni Battista, Egidio, or Federico. Now, where did Nicola di Berto come from? There are a few records that I’ve tried to make some sense of, since they all kind of say something different. The name “Sinphoronia” is similar to “Sembronica”, and it’s interesting that his mother is listed but not his father. In fact, the last name “di Berto” isn’t even mentioned in this record, but all the context pretty much confirms this is the same couple. Some further research (and help from folks on ItalianGenealogy.com…thanks!) has shown that “Vicuaro, in the diocese of Tivoli” is the town of Vicovaro, province of Lazio, near Rome. All of these records would point towards Giovanni Battista Bartoli (b. abt. 1695 in Vicovaro) came to Civitaquana and married Sempronia di Profio (b. abt. 1705 in Civitaquana). They had one surviving son, Nicola (b. 3 Mar 1737 in Civitaquana), whose last name sort of evolved from “Bartoli” to “di Berto”. 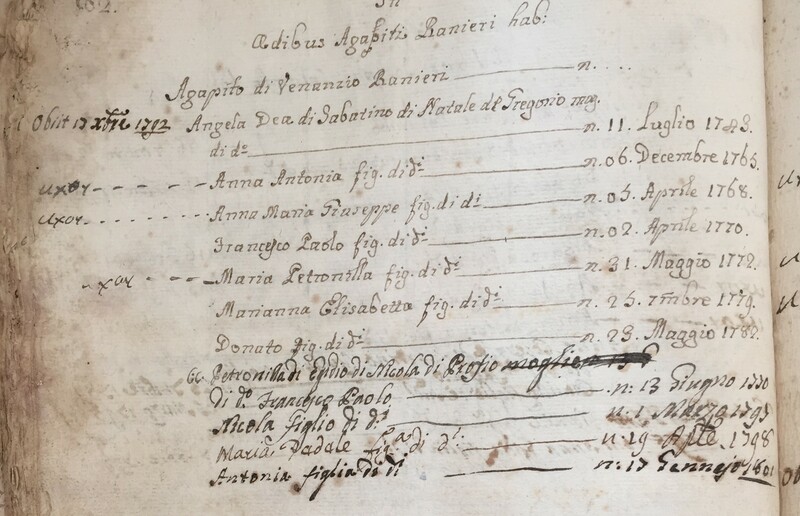 Nicola married Santa Diodati in 1755 and they had their 6 surviving children as shown in the census records above. It’s been exciting to be able to trace all families of a particular last name back to one individual, especially if that individual is originally not from the town. I certainly would not have been able to do this without the thousands of records I picked up while in Italy several months ago! Are you a di Berto? Or can you trace your ancestry in Civitaquana back to someone married to a di Berto? If so, I hope this helped, and I’d be interested to hear from you! Feel free to email me at anthony.sacco13@gmail.com to share your Civitaquana discoveries or with any other Pescara-related inquiries. Il controscritto addì 19 Marzo 1978 è deceduto in Roma atto n.489. Pescara, li 10 Gennaio 1985. Il controscritto addì 17 Marzo 1971 è deceduto in Nocciano atto n.5. Pescara, li 10 Gennaio 1985. Il controscritto addì 27 Dicembre 1978 è deceduto in Rosciano atto n.18. Pescara, li 10 Gennaio 1985. La controscritta addì 24 Febbraio 1982 è deceduto in Città S.Angelo atto n.17. Pescara, li 10 Gennaio 1985. La controscritta addì 5 Dicembre 1960 è deceduto in Nocciano atto n.14. Pescara, li 29 Marzo 1963. Il controscritto addì 26 Febbraio 1984 è deceduto in San Valentino atto n.1. Pescara, li 10 Gennaio 1985. La controscritta addì 9 Settembre 1978 è deceduto in Cugnoli atto n.15. Pescara, li 10 Gennaio 1985. La controscritta addì 27 Agosto 1960 è deceduto in Nocciano atto n.10. Pescara, li 29 Marzo 1963. La controscritta addì 29 Novembre 1977 è deceduto in Torre Passeri atto n.33. Pescara, li 10 Gennaio 1985. Il controscritto addì 12 Marzo 1976 è deceduto in Pescara atto n.99. Pescara, li 10 Gennaio 1985. La controscritta addì 19 Novembre 1979 è deceduto in Torino atto n.3936. Pescara, li 10 Gennaio 1985. La controscritta addì 1 Febbraio 1979 è deceduto in Nocciano atto n.4. Pescara, li 10 Gennaio 1985. *Marriage occurred on 21 Marzo 1896 in Roma. *Marriage occurred 18 Giugno 1896 in Catignano. *Pietro Di Tommaso, father of the bride, died 2 Giugno 1885. *Giovanna Di Meco, mother of the groom, died 19 Giugno 1891. *Camillo Silvestri, father of the bride, died 29 Giugno 1891 in Foggia. *Francesca Del Monaco, previous wife of Giuseppantonio Riccitelli, died 12 Gennaio 1892. *Salvatore Di Lorenzo, previous husband of Ciriaca Pagliaricci, died 15 Ottobre 1894 in Catignano. *Fiore Ronci, father of the groom, died 12 Febbraio 1875. *Mariantonia D’Amato, mother of the groom, died 13 Agosto 1876 in Rosciano. *Domenico Calista, previous husband of Cristina Mammarella, died 28 Novembre 1895 in Cepagatti. 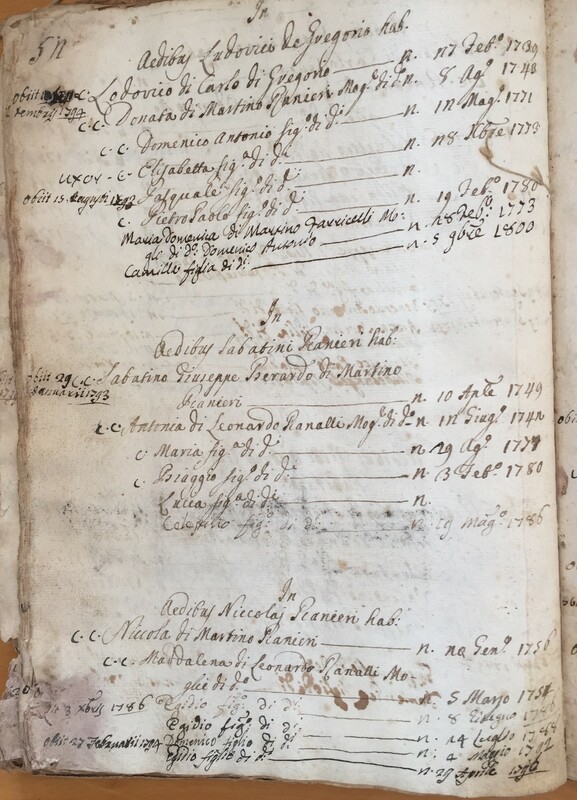 Anno Domino 1749 die decima sexta mensis 9bris ego D. Blasius Marcucci Abbas baptizavi infantem die 15a eiusdem natum ex Josepho de Rupo, et Florentia Marchionne eius uxore huius Terrae Nocciani, cui impositum est nomen Sabbatinus. Patrinus fuit Domenicus Hippoliti dictae Terrae. This is consistent with his death record from 1830 which says his parents were Giuseppe di Rupo and Lucrezia Marchionne. So there’s some variation on the first name of Giuseppe’s wife: Fiorenza/Laurenzia/Lucrezia. It’ll be hard to confirm until we find a marriage record or even baptism record. The Nocciano records have also showed a Giovanni di Rupo married to Lucia Bovo, around the same age as Felice and Giuseppe – plus it would make sense that if both Felice and Giovanni have wives with the last name Bovo, they would be brothers and the wives would be sisters. 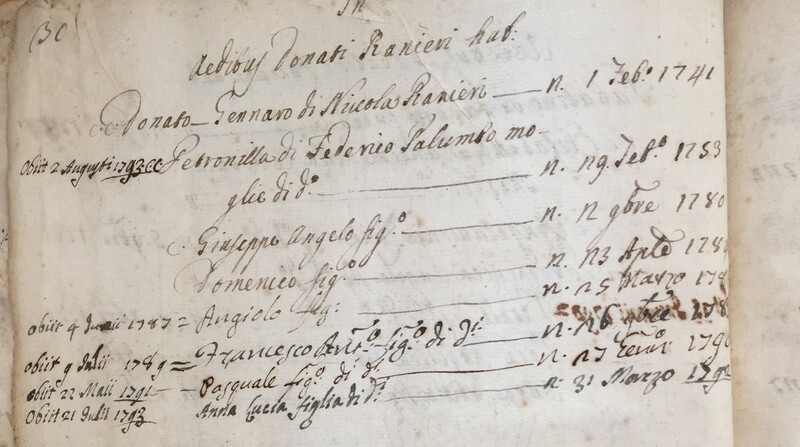 There are no other children of Giuseppe and Fiorenza in the baptism book for 1748 and later, which is all I was able to find at the archives (though I know books exist somewhere going back to the early 1600s), so it’s hard to confirm the brother Giovanni di Rupo. All di Rupo’s in Nocciano trace back to one of the three brothers: Felice, Sabatino, and Giovanni. Which points to the father Giuseppe di Rupo being from some other town, coming to Nocciano to marry Fiorenza Marchionne, where the Marchionne family is a big Nocciano family. Unfortunately that marriage likely occurred before 1748 so I haven’t found that either. I haven’t seen the name di Rupo in the records of any nearby town, so it’ll be interesting to find out where he came from. It’ll also be exciting to connect Fiorenza Marchionne to the rest of the Marchionne’s, which will be a huge step in piecing together the families of Nocciano, especially for my own tree. As for the Bovo families, the marriages of Felice di Rupo and Annantonia Bovo, as well as Giovanni di Rupo and Lucia Bovo (which may have even happened on the same day!) did not occur in Nocciano. The name Bovo appears in Pianella and the marriages would have happened around 1775, so someday when I go back and try to see the Pianella records I will be looking for that. The only piece of information I have is from the death record for Annantonia Bovo in 1817 which says her father’s name was Francesco. I’m fairly certain she was NOT born in Nocciano. If you have the name “di Rupo” in your family, let me know! If the family is from Nocciano, I think i’ve made a pretty solid case that we’re definitely related. As always, feel free to e-mail me at anthony.sacco13@gmail.com for any Nocciano/Civitaquana genealogical requests and I’ll try and help!